This charming "studio" is not too far from the main town. Even though it's technically a studio, there is a room divider that can be opened to give you a bit of privacy from the living area or leave it folded for a more open feeling. There is a super cozy queen bed and large bathroom with shower. The living area has a wood burning stove, chair and couch that folds out to accommodate 2 more people. A small dinette table completes the main living area. Just off the living room, is a great size kitchen with everything you need to prepare your meals. For such a cozy cabin, it feels very open and everything inside is the perfect combination of rustic, classy, and clean. 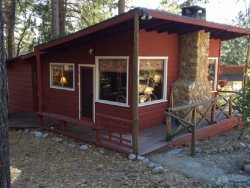 This cabin is perfect for a couple or a small family and located in a quiet neighborhood with a relaxing view. And just a fun note, all of the curtains and quits are beautifully hand made by the owners mom which gives it a super homey feel.